While lacking coordination X-Beam did not lack firepower and featured some of the big names in Solomon Islands football in their opening match including Tome Faisi and Kidston Billy. Former Koloale coach, Peter Eke, was at the helm of the debutants giving instructions from the sidelines. KOSSA’s goalkeeper Severino Aefi was their star of the day starting the match off with some fines saves. 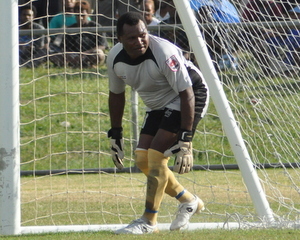 On the other end of the park, Arnold Keni, was forced to make a goal line clearance at the half hour mark after George Suri had beaten his goalkeeper. Just before halftime, however, Suri scored the first goal of the match after a perfect through pass from Leslie Nate. The match went into fever pitch in the second half with X-Beam trying their best to get on the scoreboard. Kidston Billy was on target with a free-kick in the 55th minute but Aefi made a fingertip save to deny the former Solomon Warriors forward. Another free-kick from Billy 15 minutes later, however, got the better of Aefi as X-Beam registered their first Telekom S-League goal. X-Beam sensed that the momentum of the match was in the balance and they tried to muster it their way by keeping pressure on KOSSA inside their own half. This ploy was rewarded when substitute Bata Sade beat the offside trap to score and give X-Beam the lead. Late in the match, however, a lack of concentration in their penalty box saw one of the X-Beam defenders handle the ball and KOSSA were given a penalty. Substitute David Ramosaea put the spot kick away to end the 2-2. KOSSA are having the coming weekend off while X-Beam are scheduled to meet Hana.